Whether you have disk-ready art or rough sheets of handwritten content, we can help you create and produce newsletters that meet your objectives. From 2 pages to multiples of 4 pages, from 1 to 4 color. 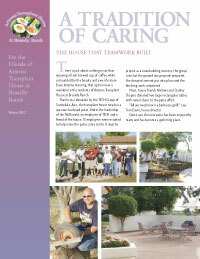 Example: Arizona Transplant House, Jan. 2002.